Carol D. Lee is the Edwina S. Tarry Professor of Education in the School of Education and Social Policy and in African-American Studies at Northwestern University in Evanston, Illinois, U.S.A. She has worked in the Learning Sciences Program at Northwestern from its inception, the first such program in the U.S. She received a B.A. in the Teaching of English from the University of Illinois, Champaign-Urbana in 1966, a Masters of Arts in English from the University of Chicago in 1969, and a Ph.D. in Education from the University of Chicago in 1991. Her career spans a 49 year history, including work as an English Language Arts teacher at the high school and community college levels, a primary grade teacher, and her current university professorship. She is a founder of four African centered schools and institutions that span a 46 year history, including three charter schools under the umbrella of the Betty Shabazz International Charter Schools (est. 1998) where she serves as chair of the Board of Directors. Dr. Lee’s research examines learning from a cultural-ecological framework. She views learning as multi-dimensional, including dynamic relations among cognitive, phenomenological, emotional and social factors. She considers these factors as constituting a dynamic system that is influenced additionally by physiological processes and by people’s participation in cultural practices within and across settings. She situates this complex framework in the study and design of environments that support literacy, specifically reading and argumentation in academic content areas, with a particular focus on learning to engage in literary reasoning and argumentation. She has developed a framework for the design of robust learning environments called Cultural Modeling. In early phases of Cultural Modeling, the focus was on scaffolding everyday knowledge, particularly of speakers of African American English, to support literary reasoning. More recent iterations of Cultural Modeling address how schools as organizations and classrooms as local sites of learning can support the cognitive, phenomenological, emotional and social demands of rigorous disciplinary learning among K-12 student populations wrestling with challenges associated with poverty and positioning with regard to race and gender. She is the author or co-editor of three books, the most recent Culture, Literacy and Learning: Taking Bloom in the Midst of the Whirlwind, 4 monographs, and has published over 74 journal articles and book or handbook chapters in the field of education. Dr. Lee’s peers and colleagues have selected her for a number of prestigious leadership positions. She is a past president of the American Educational Research Association (AERA), AERA’s past representative to the World Educational Research Association, past vice-president of Division G (Social Contexts of Education) of the American Educational Research Association, past president of the National Conference on Research in Language and Literacy, and past co-chair of the Research Assembly of the National Council of Teachers of English. Dr. Lee’s contributions to scholarship, teaching, and service have been recognized by numerous awards. She is a member of the National Academy of Education in the United States, a fellow of the American Educational Research Association, a fellow of the National Conference on Research in Language and Literacy, and a former fellow at the Center for Advanced Studies in the Behavioral Sciences. She is a recipient of the Distinguished Service Award from the National Council of Teachers of English, Scholars of Color Distinguished Scholar Award from the American Educational Research Association, the Walder Award for Research Excellence at Northwestern University, the Distinguished Alumni Award from the College of Liberal Arts at the University of Illinois-Urbana, The President’s Pacesetters Award from the American Association of Blacks in Higher Education, the Lifetime Achievement Award from the American Association of Colleges of Teacher Education, the Inaugural William Watkins Award from the Society of Professors of Education, and an honorary doctorate from the University of Pretoria, South Africa. She has led three international delegations in education on behalf of the People to People’s Ambassador Program to South Africa and the People’s Republic of China. 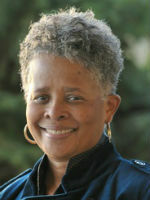 She has served as a visiting scholar at the National Education Association and the Center for Multicultural Education at the University of Washington, Seattle. Her dedication to mentoring emergent scholars is reflected in her having been one of the founders of the National Council of Teachers of English program “Cultivating New Voices,” a program that has successfully mentored scholars of color in literacy education since 2000. She has personally mentored new scholars in that program for over a decade. Her mentoring work was also recognized by the bestowal of the Spencer Foundation Mentoring Award in 1999. She has further been recognized for her community based work over the last four decades, including from ETA Creative Arts Foundation, the DuSable Museum of African-American History, The Black United Fund – all of Chicago – as well as recognition from the Bridge Crossing Jubilee in 2013, which annually celebrates “Bloody Sunday,” the historic crossing of the Edmund Pettis Bridge in Selma, Alabama in 1965. Dr. Lee is married to Dr. Haki R. Madhubuti, poet and publisher of Third World Press, and is the mother of three adult children and three grandchildren. Together with Dr. Madhubuti, her extended family includes 6 adult children and seven grandchildren. * The FABBS Foundation would like to thank Dr. Susan Goldman for nominating Dr. Lee for this honor and for leading the effort to spread the word about her nomination. Would you like to honor Dr. Lee? It’s not too late to have your name added to the list of donors! You can make your donation to Dr. Lee’s In Honor Of… campaign at anytime.